CHICAGO--(BUSINESS WIRE)-- Hyatt Hotels Corporation (NYSE:H) today announced a Hyatt affiliate has entered into a franchise agreement with Hotel Corporation Uruguay, S.A. for Carmelo Resort & Spa in Carmelo, Uruguay. Formerly managed by Four Seasons Hotels & Resorts, the resort will be operated as Carmelo Resort and Spa, a Hyatt Hotel. The hotel will be managed by the Hotel Corporation Uruguay, S.A. in conjunction with SMI Hotels & Resorts. Guests will now be able to earn and redeem Hyatt Gold Passport points when staying at Carmelo Resort & Spa, A Hyatt Hotel. Located in Carmelo, Uruguay, the luxury resort is nestled on the banks of the Rio de la Plata river, and is strategically situated for guests to enjoy the natural surroundings of southwest Uruguay. The 44-guestroom resort incorporates Asian and South American design touches, including the use of imported woods, that, when combined, create a rich holistic zen retreat environment for guests, all the while maintaining authentic Uruguayan hospitality and terroir. 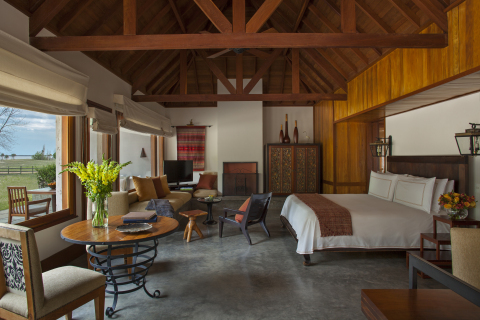 Each of the resort’s exquisitely appointed 24 bi-level suites and 20 detached villas are designed for travelers to live and luxuriate in. All accommodations offer a private terrace for outdoor living and private dining, and stunning views of the surrounding area that includes a eucalyptus forest, pine groves, vineyards, and the famed Rio de la Plata. Consistently recognized as one of Latin America’s top luxury hotels, Carmelo Resort & Spa has garnered honors from major publications including Travel + Leisure's “World's Best Top 100 Resorts and Hotels” and Condé Nast Traveler’s “Best Hotels/Resorts in South America,” among many other consumer and industry awards. Carmelo Resort & Spa, A Hyatt Hotel offers four on-property dining options, all of which feature local products the Carmelo region is known for, such as Tannat wines from surrounding vineyards, locally produced cheese and dairy products, and a variety of traditionally-cured, organic and grass-fed meats. Pura is the resort’s signature all day dining restaurant, serving Mediterranean dishes as well as the flavors of Uruguayan cuisine. The restaurant also offers exceptional views of the resort’s outdoor double-cascade swimming pool, and a distant view of the Rio de la Plata. Mandara Bar features a selection of local meats and tapas in a contemporary setting, along with a spectacular terrace where guests can lounge and socialize. Offering guests a taste of the river’s daily catch, Rio Bar features a variety of fresh fish dishes and unique cuts of grilled meats. Designed for relaxing, Shiva Lounge is a tucked-away retreat for unwinding with a cocktail. The beauty of the Uruguayan landscape offers a perfect backdrop for the resort’s award-winning spa, Chandra, a holistic zen spa. Its Asian-inspired design is a sanctuary for guests to find physical and spiritual wellbeing. Chandra offers guests a variety of stress-reducing meditation techniques, yoga and relaxation therapies, meditation sessions, massage, aromatherapy as well as a variety of soothing water, skin-care, and beauty treatments. The spa facility offers guests an indoor heated pool, dry sauna, and a fully equipped fitness center. A large outdoor swimming pool with a cascading waterfall and lounge areas complement the relaxation experience. Guests of the resort can choose from a wide range of nearby recreational activities. The resort features two all-weather lighted tennis courts, and complimentary bicycles are available for guests to use to explore the resort grounds, nearby woods and grasslands. The resort’s complimentary shuttle service provides transportation to the 18-hole, world-class Carmelo Golf Course, which was designed by Randy Thompson & Kelly Moran and winds around numerous lakes, wetlands, and native trees. In addition, a variety of excursions are available in the Carmelo area, from fishing, bird watching or sunset cruises on the Rio de la Plata, to Polo classes and horseback riding on local trails. The resort community of Carmelo offers visitors an airfield certified to receive international flights, as well as a private harbor and marina for those arriving by boat. The nearby Narbona Estate gives visitors a first-hand look at the renowned and award-winning Tannat wines that are locally produced. Among the activities offered on the Estate grounds are vineyard tours, grappa-making lessons and tastings, wine and cheese tastings - all guided by the estates winemaker. Carmelo Resort & Spa, A Hyatt Hotel offers a unique and privileged destination for meetings, special events, and weddings. Event facilities at the resort combine well-equipped conference rooms with stunning views of the Rio de la Plata, surrounded by Uruguay’s natural environment. The resort offers two boardrooms, the largest one at 106-square-meter (1,141-square-foot) with a connecting terrace, ideal for executive retreats. The resort’s “estancia” is a ranch-style outdoor event space, ideal for large gatherings and barbeque feasts. The nearby convention center, Narbona Estate, and the private harbor offer stunning settings for a variety of meetings, events and celebrations with beautiful views of the Uruguayan landscape and local terroir. Carmelo Resort & Spa, A Hyatt Hotel is a two-hour car or ferry ride from Puerto Madero, Buenos Aires, Argentina or a 20-minute flight via small plane from Aeroparque Jorge Newbery airport in Buenos Aires. Montevideo, Uruguay’s capital and largest city, is less than four hours away by car or a 35-minute flight via small plane. For additional information regarding Carmelo Resort & Spa, A Hyatt Hotel, or to make a room reservation, please visit www.carmelo.hyatt.com. The term "Hyatt" is used in this release for convenience to refer to Hyatt Hotels Corporation or one or more of its affiliates. The owner of Carmelo Resort & Spa, A Hyatt Hotel (The Resort) is Eduardo Alberto "Pacha" Canton has worked many years in the financial market and in the family business. At a very young age, Eduardo designed and developed a Master Plan in Carmelo, Uruguay. It included a luxury resort hotel & spa; the Carmelo International Airport, which is ranked 2nd in number of private flights in Uruguay; a championship golf course, designed by Randy Thompson and Kelly Moran and developed by American Golf course Design LTDA; a private port and marina, with annual boat traffic of 800 comprised of customers from The Resort and the El Faro luxury housing real estate development, which has 140 constructed houses to date, and the Narbona Estates that include a renown boutique Winery. The Master Plan was completed with the addition of two luxury real estate developments, closely tied to horse ranches. Thirty years after his Master Plan was sketched, it has grown and matured as a contributor to Carmelo’s history and culture.